There’s so much to think about when a new baby arrives. It can be pretty daunting! When your baby is a newborn, dental care might be the last thing on your mind. Or like many people, you may think that baby teeth aren’t that important since they’ll eventually fall out. But dental care in Chesapeake should begin even before that first precious tooth appears. Start out by using a soft cloth and gently wipe his gums when you’re giving him his bath. When his teeth start to appear, use a soft baby toothbrush and a tiny drop of non-fluoride toothpaste to gently brush his teeth twice a day. Fluoride should be introduced into his system no earlier than 6 months, and even then in minimal amounts until he reaches 12 months. You also want to be sure your own dental habits are thorough and your mouth is as germ-free as possible. When you taste your baby’s food with his spoon, or temporarily put his pacifier in your mouth to “clean” it, you may be passing on germs and bacteria. If he knocks out a baby tooth, don’t worry — a permanent tooth will eventually grow in its place. See the dentist to make sure that no underlying teeth were damaged and will still have space to grow in. Baby teeth are important because they help your child eat and speak and because they hold a spot in your child’s mouth for his permanent teeth to come in properly. Your baby should have a first dental checkup about the time of his or her first birthday. 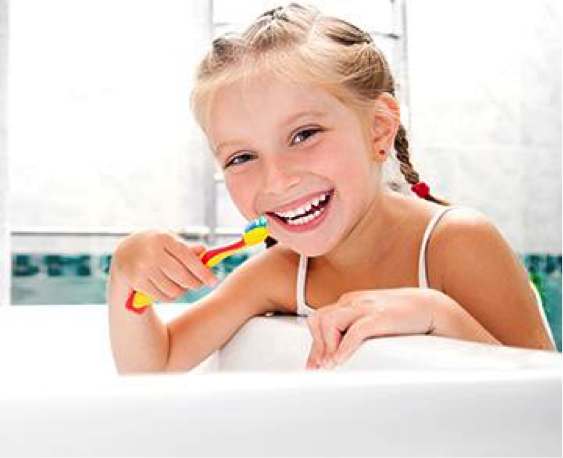 Starting early with routine dental care will help your child develop a lifetime of good habits! And remember to keep up with your own dental care! Call our dental office in Chesapeake for checkups at 757-546-5262.